If you’re a not-for-profit who’s thinking about inclusive design and are unsure about what steps to take, here are some of the important steps we took in our recent Ask Izzy for Aboriginal and Torres Strait Islander communities project. Aboriginal and Torres Strait Islanders (A&TSI) make up almost a quarter of people supported by homelessness services and are twice as likely to visit a hospital for preventable conditions. That’s why we enhanced Ask Izzy, the mobile website that connects people with housing, a meal, health and wellbeing services, support and counselling and much more, to improve A&TSI people’s access to services, with help from the Victorian Government. In redeveloping Ask Izzy we wanted to make services easier to access for A&TSI people, so we asked them how we could make Ask Izzy better. In partnership with Navy Design, we worked to improve the A&TSI user experience and break down the barriers of feeling embarrassed and overwhelmed when seeking support, and instead help people to feel welcome and included. 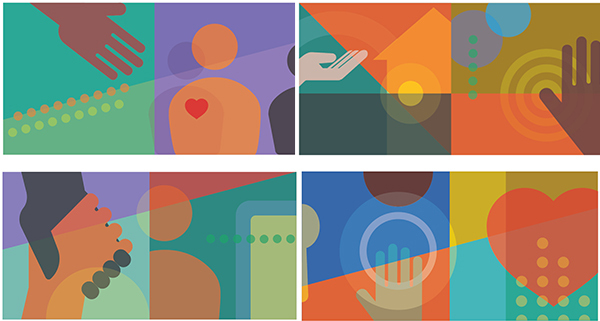 Undertaking a co-design approach, we spoke extensively to people in the community to begin to learn about the visuals, colours and symbols that people found appealing, as well as important features they look for when searching for health and wellbeing services. The ability to easily see which services are part of the National Disability Insurance Scheme, or have full wheelchair access are both features that were requested and are now on Ask Izzy. We now ask people if they would like to see A&TSI specific services first. With 16 922 A&TSI services and more than 300 000 health, welfare and community support services listed on Ask izzy, the team had to find ways to get the A&TSI people to the right services for their unique needs. Through a range of design activities, the A&TSI community helped the team understand what information was vital for them. With younger generations often turning to their elders for advice and comfort, usually through face-to-face conversations, the team learnt that many A&TSI community and/or health centres are not just seen as a place to get assistance but more as a home and somewhere to feel safe. That’s why on Ask Izzy we now ask people if they would like to see A&TSI specific services first. While A&TSI users instantly recognised traditional patterns and motifs when testing some early visual concepts, the team found that they were mindful that other users may feel alienated by these. The majority, especially younger people, preferred a non-traditional look and feel, responding positively to bright colours, icons and flags, expressing how these made them feel optimistic and included when using Ask Izzy. We also sought feedback from non-Aboriginal people to ensure the new designs are inclusive of all audiences. This included the Council of Homeless Persons Peer Education Support team who have provided feedback and support throughout the project. Dan Laws, Coordinator of the Aboriginal Homelessness Network at Ngwala Willumbong, has assisted Infoxchange in reaching out to local communities and says this project has been a long time coming. “As an Aboriginal person and one who works in the homelessness and family violence sectors I have found Ask Izzy to be beneficial not only for myself as a reference guide, but the feedback from community has been one of ‘at last’, in terms of its helpfulness,” Dan says. Some of the organisations we would like to thank for their input in to the new designs include the Council for Homeless Persons, Ngwala Willumbong, the Victorian Aboriginal Health Service, Youth Support and Advocacy Service, the Bunjilwarra Koorie Youth Alcohol and Drug Healing Service, Co-Health’s Billabong BBQ in Collingwood and Foodshare in Braybrook, Healesville Indigenous Community Services Association, the Albury Wodonga Aboriginal Health Service and the Department of Health and Human Services. Visit the new, colourful and inclusive Ask Izzy.